Spain's Princess Cristina has lost an appeal to have the two charges she faces of tax evasion dropped. A court in Palma ruled that the 50-year-old sister of King Felipe must stand trial in a case involving her husband's business dealings. If found guilty, she could face a maximum of eight years in jail. 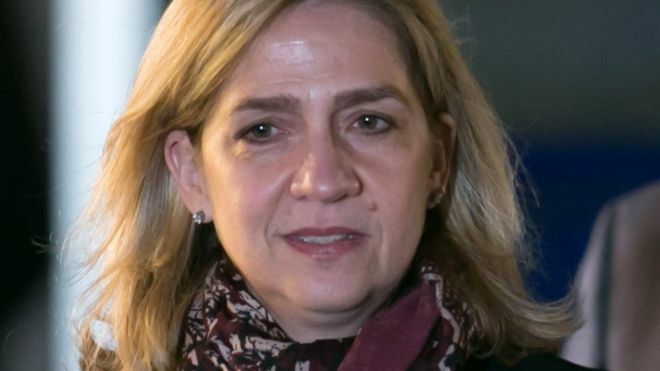 Princess Cristina has denied knowledge of the alleged embezzlement scam that also involves her husband and 16 other defendants. They all deny the charges. The case was launched in 2010 and has become highly symbolic of perceived corruption among Spain's elites, including the royal family. Last year, King Felipe stripped his sister and her husband Inaki Urdangarin of their titles, the Duke and Duchess of Palma de Mallorca. The princess's lawyers argued that as public prosecutors had refused to press charges against her, the counts should be dismissed. But the three judges agreed to continue with the prosecution using the evidence filed by the the anti-corruption group, Manos Limpias, meaning "Clean Hands". The charges relate to the real estate company Aizoon that she owned with her husband, a former Olympic handball medallist. She is accused of making personal use of Aizoon funds for paying for clothes and dance lessons for the couple's children as well as work on the couple's Barcelona mansion, which reduced the firm's taxable profits. Her husband is alleged to have used the non-profit Noos Institute sports foundation he ran as a vehicle to win falsely inflated contracts from regional government bodies, before channelling the money to personal accounts via tax havens. Noos is alleged to have received more than €6m of public money, most of it from the Balearic Islands and Valencia regional governments. If found guilty, Mr Urdangarin could face 19 years and six months in jail.